The next Assassin’s Creed game after Victory may finally bring ninja and assassins together. An Assassin’s Creed fan has spotted what certainly looks like a heavy hint that the next game after Victory will be set in Japan. 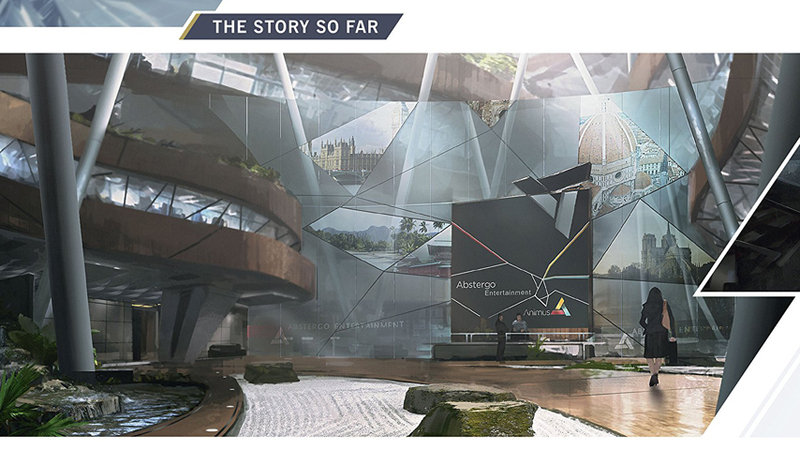 Ubisoft forums member Cornik22 was looking through the Assassin’s Creed 4: Black Flag official art book when they noticed an image of the Abstergo building which appeared in that game’s modern day sections. The building’s foyer apparently contains, or was set to contain, a feature wall dotted with promotional art for Abstergo’s experiences. There are six pieces of artwork visible in the image, and it’s all too easy to draw connections to existing games from them. The Santa Maria del Fiore in Florence appeared in Assassin’s Creed 2. Notre Dame appeared in Assassin’s Creed: Unity. Big Ben will appear in this year’s release, Assassin’s Creed Victory. That leaves just two images unaccounted for. One shows an unidentifiable slice of what looks like a church, which may refer to the original Assassin’s Creed or even Assassin’s Creed 3 – you just can’t tell. The final remaining image, however, shows what looks like a Chinese, Japanese or possibly Indonesian castle or temple. Nothing like that has appeared in a flagship series entry. Any of those locations would make for an interesting game, although the synergy between ninja and assassins is compelling, and suggestions that Japan might be on offer have cropped up in in-game lore (images seen at the end of the first Assassin’s Creed, database entries in Assassin’s Creed 4: Black Flag) as well as transmedia products. Whatever Assassin’s Creed delivers in 2016 we’re expecting a lot from it; Ubisoft Montreal is expected to return to the helm after taking a rest year so Ubisoft Quebec can work on Assassin’s Creed: Victory. Ubisoft Montreal has said it wants time to experiment and innovate, so that’s exciting. Assassin’s Creed 3 director Alex Hutchinson did once say that Japan was “too boring” for the franchise, meaning that its history has been explored thoroughly in popular culture before now. He later said the recent dearth of games set in Japan caused him to reconsider his stance.